You could probably fill an album with photos of Colin and me flying that look much like this. You may think we were posing for the camera, but this is a candid shot with our customary in-flight expression, taken by a passenger sitting on the cowling. I am not sure which plane this is, but I suspect it’s an Eclipse, the Diamond DA20 that Colin and I flew on bounce number two. Our most recent flight has no photos because neither of us was smart enough to bring a camera and, while both our passengers had them, they were too busy gabbing to shoot. 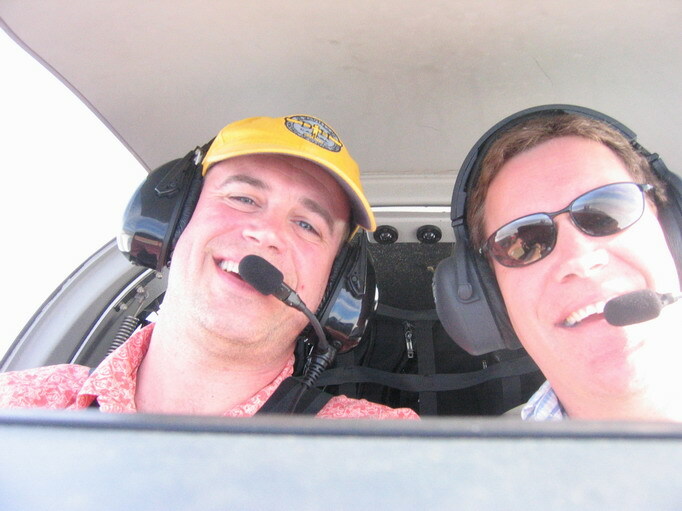 Colin and I flew Bob and Ken Short (the Slammer interior designer) to Vegas for some meetings. The weather was supposed to be clear and bright all day with really impressive winds aloft. We flew to Vegas with forty knot tailwinds and expected a similar headwind on return. After dropping Bob at Boulder City, where he was ferried by Enterprise to the Castle for a tour of inspection, Colin and Ken and I headed for Henderson. Our first lesson came on the way into Henderson . We were flying Colin’s favorite plane, the Diamond DA40. All the headset jacks are in a cluster between the seats. This is a poor design. Somehow we exchanged headsets after I fled the cockpit in Boulder City to offload an Indian dinner. The mike and headset travel together, so with Colin’s headset on my head I would have had to push his talk button rather than mine to transmit my dulcet tones. As it was, every time I keyed my mike to talk Colin’s would go live. Since he was not talking we would just transmit static. Boulder City is a CTAF (Common Traffic Advisory Frequency, no control tower) airport so we just announced our intentions and flew away to Henderson. We stayed below the Class Bravo of Las Vegas and did not realize we had a problem until we called Henderson . We could hear them just fine but all they could hear of us was static. Both Colin and I called them to no avail. They heard mike clicks though, so we were interacting though idiot’s Morse (one click no, two clicks yes) to get a landing clearance. As we taxied I realized the problem. It was not until I got home that I realized the implications. We departed Boulder City without telling anyone a blessed thing. The Extra that departed behind us made sure to tell the world that he was following the Diamond – that must be because he thought we were being idiots for not announcing our intentions. I doubt at this point a screw up like that would rise to the level of getting a blog mention. I write in this blog to exercise (and exorcise) the writing demon, not to catalog my every little flaw. No, we managed a real screw up that in retrospect I decided needing writing about as a motivator to not do it again. When I got my license to fly planes one of my heroes, a pilot/scientist who flies float planes, said, “In the next hundred hours you’re going to scare the hell out of yourself a couple times. Try to be as careful as you can.” Well, I scared myself. Not so that I was scared at the time, but so I was scared in retrospect thinking about what might have been. Had Colin and I been in a less technologically advanced airplane I am not sure the outcome would have been as trivially worrisome as it was. Makes me think harder about the wrecks that I rent when I am not flying with Colin, but a fellow has to get a fix somewhere. The weather for the return trip was a fifty knot headwind. That can produce some hellacious turbulence, but in this case the ride was really smooth. We flitted amongst the desert clouds, skipping over their tops at nine thousand five hundred feet, riding the updrafts and downdrafts and in general having a great time. Bob, worried about turbulence and on tighter schedule than Ken, Colin and I, opted for a Southwest flight home. Colin snoozed and Ken and I oohed and ahhed about the clouds. Eventually we got up to the edge of the mountains that ring the LA basin. The idea was to scoot across a five thousand foot pass and drop in to El Monte where Colin would leave me for Sharalyn to pick up. He would then continue on to Santa Monica with Ken. When I checked the weather before I left Henderson the El Monte report was for high overcast and low broken clouds. At Santa Monica the same high overcast was accompanied by a scattered low layer. As we cleared the mountains and tuned in the El Monte ATIS it said there was twelve thousand foot overcast and two thousand five hundred foot broken clouds. Turned out to be close but not quite right. We crossed the mountain at nine thousand five hundred feet with flight following passing us to LA Center just as we crossed. We have mentioned elsewhere that the LA controllers are big league. They are just amazing at doing their job well and without an edgy tone. As I flew us across the pass there was a solid layer of puffy clouds below us. The tops were at four thousand and, if El Monte was to be believed, the bottoms were at twenty-five hundred. This was not a broken layer though it was full on solid clouds. Then I saw a hole. This sort of hole has a name in aviation circles… sucker hole. At the bottom of the hole were a few lights so I told ATC that I could descend VFR until I got under the clouds if I headed down right now. He cleared me for a VFR descent and I went down as fast as I could. We were dropping at fifteen hundred feet per minute, but it was beginning to look like I would hit the edges of the hole before I got under the overcast. Colin dropped the power which slowed us a little, but we were still going to go into instrument meteorological conditions (IMC). That’s the single worst thing a VFR pilot can do. I have done it twice before. Each time I sweated bullets but remained calm. This time I saw that the hole did not in fact go to the bottom of the clouds. It did indeed show me the earth, but the earth was at an altitude of about thirty-five hundred feet. This was worrisome, but in just a few seconds I had other things to consider as we plunged into the clouds. I punched the autopilot to keep the wings level. The terrain avoidance feature of the Garmin was busy convincing me that we were in no immediate danger of slamming into the foothills, though there was an impressive red area behind us that meant circling was out. After a few seconds of thought I decided that confession would be good for the adrenal gland if not the soul and called ATC. I explained that now I was in IMC and needed a course of action. He immediately replied with vectors to an instrument approach to El Monte . It made not a whit of sense to me as I have not yet afforded the instrument course. I revealed this shortcoming to the controller. The other chatter on the channel immediately silenced. ATC told me to stop descending and to level the wings. I revealed the existence of our autopilot and was reminded of one of its operating parameters. When you turn it on it grabs your current vertical speed and tries to hold it. We were still descending fast. I punched in a zero descent. To be sure I then went to a hundred foot per minute climb. Colin noticed we were getting slow and decided that having throttle completely retarded was a bad plan. He restored power and we were shortly in straight and level flight. The seat of my pants told me otherwise, but the wings were level and we were steady at three thousand. ATC gave me a heading due south and told me to descend for vectors to Brackett Field, the little airport near Pomona . Finally, we broke through the clouds, right at twenty-five hundred feet and there was the airport. I called the tower, got clearance to land and gave the controls to Colin to land at Brackett. All this flying in the right seat has meant very few landings for me and I was much happier with him performing a night landing (did I mention it had gotten dark?). We sat on the ground for a bit thinking over our options. Santa Monica was still VFR, and so was El Monte . We could just pop up, drop me at El Monte and Colin and Ken could continue on to Santa Monica . After a bit of chatting we decided it would be better all around to continue the two pilot approach to low visibility flying and we took off direct Santa Monica . The flight was beautiful; we skimmed along at just fifteen hundred feet, well under the Class Bravo for LAX and just under the clouds. As we got near Santa Monica the clouds became broken and finally scattered and Colin set us down for a final time. In retrospect the few minutes of IMC worried me. If we had not had the terrain awareness we would have had trouble. If the plane had not had such a good autopilot we would have had trouble. About the only smart thing I did was calling ATC to ask for help. Clearly, the right thing to do would have been to pop over those mountains, look at the clouds and tell flight following that we needed to try for Santa Monica since the clouds were too dense for El Monte . They would have figured a route around the Class Bravo for us and landing at Santa Monica would have been a cake walk. Hopefully I will internalize this little lesson. This entry was posted in Flight, Just Words, Trip and tagged help. Bookmark the permalink.